For this whimsical bridal portrait, I borrowed the name Through the Looking-Glass from Lewis Carroll and his celebrated series Alice’s Adventures in Wonderland. A natural choice for the title of this image, wouldn't you say? 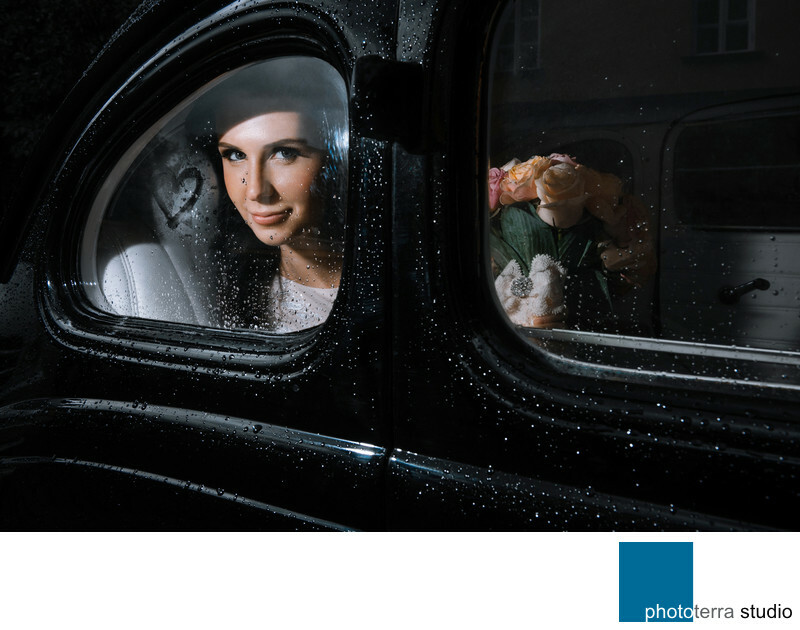 Not only that this wedding in Moscow, Russia, was themed after the Alice in Wonderland novel, but also the bride is literally looking through a glass window of her black vintage limo. Fun fact, did you know that Lewis Carroll was a photographer? Ha! Take a look at his photo of Alice Liddell who may or may not have been the inspiration for his renowned children fiction. When our Alice, saw her groom outside of the car, she fogged the glass with her breath and drew a heart with her finger. Her gesture produced an unexpected moment that I had to capture right that instant or miss it forever. The bride might get self-conscious if I wait, and the fog will surely dissipate, I thought. She saw me pointing my camera at her, and the moment when she looked at me, I snapped a number of shots in succession with only one flash, framing the flowers to the right. Lewis Carroll used natural light for his photographs relying on it for perfect exposure. I prefer to work with flash; it provides me with endless opportunities for visual narrative. This image was voted as the Best of Toronto Photography by the Event-Source wedding blog.